Beluga Noble Vodka Luxury Russian Vodka is a popular Vodka available from 31dover.com in 70cl to buy online. 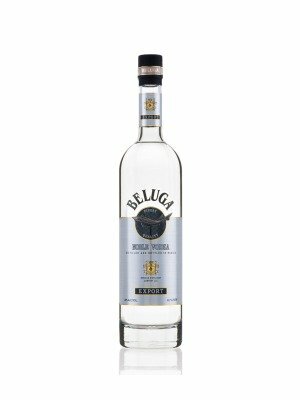 Visit 31dover.com for the best price for 70cl of Beluga Noble Vodka Luxury Russian Vodka or compare prices on our other Vodka products. Russia's number one selling super premium vodka is finally available! Beluga Noble Vodka is a malt based vodka is being produced in line with traditions dating back over 100 years. By doing so, Beluga Vodka enjoys a NATURAL fermentation process (unlike other grain spirits that require enzymatic chemical additives). As a result, Beluga is a natural, environmentally friendly vodka that is produced without the use of any genetically modified products. We recommend you try this soft, well balanced vodka, because mere words don't do it justice! Where to buy Beluga Noble Vodka Luxury Russian Vodka ? Beluga Noble Vodka Luxury Russian Vodka Supermarkets & Stockists. You can buy Beluga Noble Vodka Luxury Russian Vodka online in most retailers and find it in the Vodka aisle in supermarkets but we found the best deals online for Beluga Noble Vodka Luxury Russian Vodka in 31dover.com, DrinkSupermarket.com, Amazon.co.uk, TheDrinkShop, and others. Compare the current price of Beluga Noble Vodka Luxury Russian Vodka in 70cl size in the table of offers below. Simply click on the button to order Beluga Noble Vodka Luxury Russian Vodka online now.